The May, 1967 issue of Esquire–this was during the period when it was edited by Harold Hayes and was probably the best magazine in the history of magazines–featured an article by Garry Wills and Ovid Demaris about Jack Ruby, the Dallas nightclub owner who killed Lee Harvey Oswald. 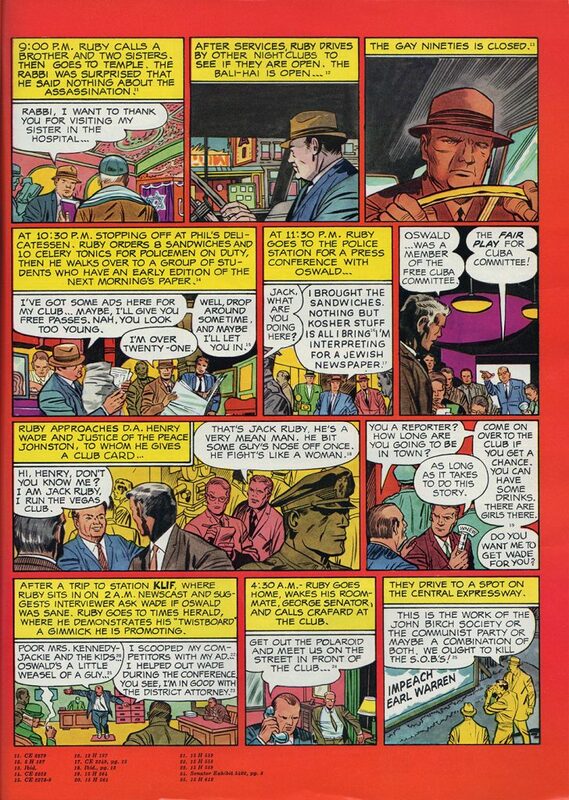 That piece, published after Ruby’s death in January 1967, was complemented by something remarkable: “46 Hours and 36 Minutes in the Life of Jack Ruby,” a three-page comic strip beginning with Ruby learning of JFK’s assassination and ending with him shooting Oswald. 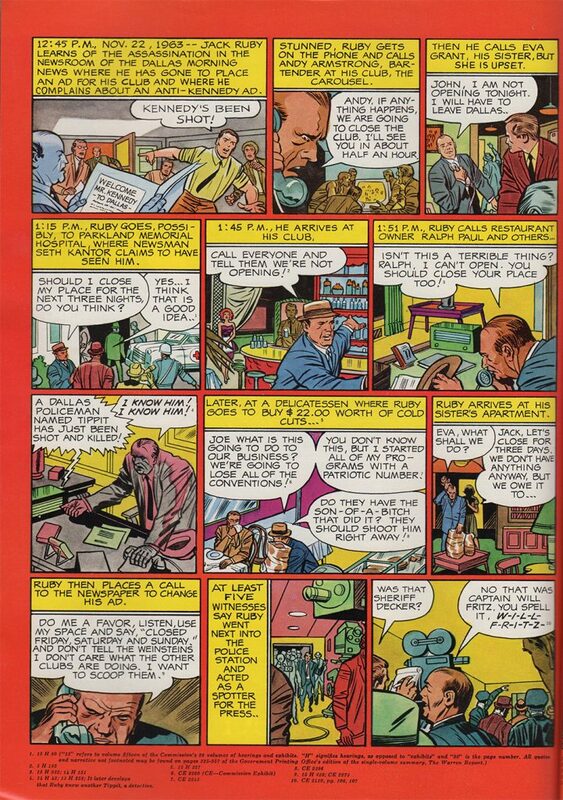 The strip was written and drawn by Jack Kirby, inked by Chic Stone and annotated with references to the Warren Commission hearings. Giving Kirby the assignment was a stroke of genius–despite, or perhaps because of, the fact that it was so atypical. 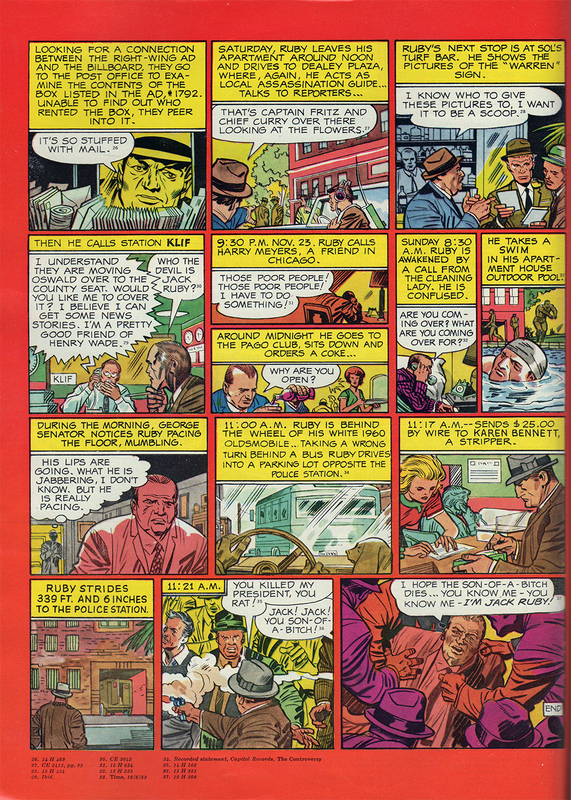 There’s virtually no action–the shooting of Oswald takes place in the next-to-last panel–and even though Esquire‘s pages were roughly twice as large as those of a comic book, everything is broken into tiny, cramped panels, each with a caption, and mostly depicting a scene in its entirety. Ruby looks like a dissipated, angry version of Kirby’s later creation, Goody Rickels. He’s a small man who thinks he’s big, and other than brooding over the president’s assassination and killing Lee Harvey Oswald, he spends most of the three pages doing things such as ordering cold cuts, placing advertising for his club, going for a swim, demonstrating something called a “Twistaboard,” and having a Coke. If you’re reading the story in 2014 and are familiar with the comics Kirby was drawing for Marvel in 1967, his association with heroic fantasy somehow makes the details of the crime depicted in “46 Hours and 36 Minutes in the Life of Jack Ruby” even more shockingly banal, and therefore more powerful. But it must have been potent stuff in 1967, even if you didn’t know who Jack Kirby was and were not a reader of Fantastic Four. Anyhow, here’s the strip. It’s available elsewhere on the web, but I didn’t know about it until I happened to buy the issue at an antique store. It should be famous. Maybe it is, and I somehow didn’t know.